It’s 2018 – Happy New Year! When I was floundering through high school at the end of the 1980’s, I remember reading some news article (in a real printed thing, as we didn’t have online news) that projected Something-or-Other happening by 2018. I remember thinking – with the scoffing scornfulness of the know-it-all teen-ager – This is science fiction. I mean, really! Two thousand eighteen? Twenty-eighteen? What a silly-sounding date. I hope 2018 is a splendid year for you, replete with peace, happiness, good health, many blessings – and, of course, lots of wonderful stitching! Towards the end of the old year and the beginning of the new year, I like to look back to take stock of accomplishments before readjusting and setting new goals. 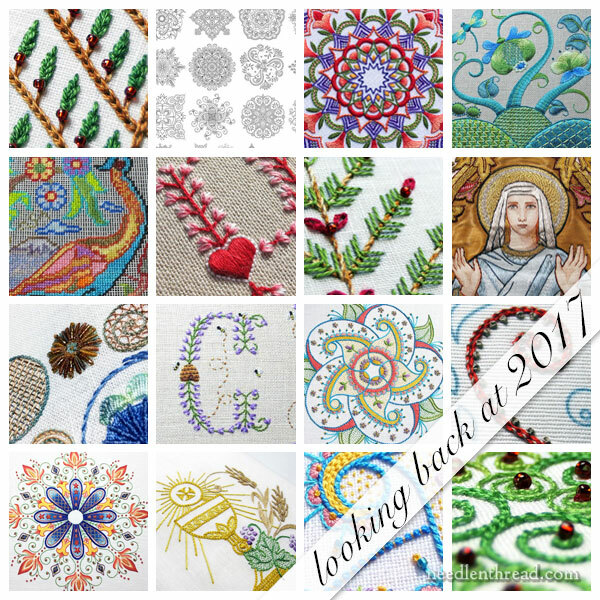 2017 was fairly busy here on Needle ‘n Thread, and while I haven’t accomplished everything I hoped to accomplish last year, I’m excited that I have the opportunity to try again in 2018! Some of the more notable accomplishments, needle-and-thread-wise, include finishing a few larger projects, lots of little projects (lots of monograms and Christmas trees! ), adding five (that’s a record!) e-books to my little-but-growing online shop, and starting a few projects that will continue (and hopefully end) in 2018. One thing I didn’t manage, which is now a hot priority, is completing a new section of Needle ‘n Thread that I started building over a year ago. This year, it must get off the ground. So behind the scenes, I’ll be chipping away on that, with an anticipated launch some time this year. I’m also actively seeking studio space away from my home this year, where I can set up a classroom for local classes with real people, face-to-face, and manage some other Needle ‘n Thread business ideas. I really want to get back to teaching children to embroider, but I can’t do that without a separate space. I also need to grow the business side of Needle ‘n Thread (or I won’t be sticking around a whole lot longer! ), and I can’t do that without a separate space, either. So that’s high on my goal list for this year – to find a place to lease (or buy, if necessary) and to find a way to manage the expense. I hope that, when I’m writing a similar article on January 1, 2019, I will have accomplished these two major goals! The first embroidery project we’ll tackle together in 2018 here on Needle ‘n Thread is Party in Provence, this embroidered kaleidoscope that I finished last year. I’ll be taking you through it step-by-step, so that those of you who want to embroider your own version, can! The articles covering Party in Provence will include all the materials, the set-up, and then stitch instructions, with various tips and ideas to help you successfully embroider the design (which is available in my Favorite Kaleidoscopes e-book), and that you can apply to other embroidery projects, too. Even more than I love Mondays, I love the beginning of a new year! It’s the perfect time to take stock, with gratitude, of the good things in our lives, and to set into motion new plans for improvement and growth. For me, there’s always a lot of excitement with the dawn of a new year – lots of anticipation for the things I want to do, the goals I want to accomplish, and the journeys that will get me there. Maybe a little trepidation, too, but nothing that a positive attitude and a little determination can’t overcome. So here’s too a new year, new accomplishments, and new journeys together as we explore all things needle-and-thread! I apologize for not popping in at the end of last week, as I’d hoped to do. Many of you reached out to ask where I disappeared to. I’m still here – just recovering from the typical Winter Wog that always seems to strike this time of year. I’m on the mend now and should be back to normal in a day or so. Thanks for your concern and for your kind notes! Always appreciated, and the best of remedies! And a Happy New Year to you! You have given much joy over the last year to so many. You have also braved a lot with your health challenges ( I have just returned from a month in Michigan helping my sister recover from a mastectomy). A suggestion – so many of us would like to help you for all you give to us. Why not start a “Go Fund Me” page for your new studio and let us help you. Or a scholarship fund for teaching children to embroider. Both are great causes. A Go-fund-me is a great idea, I’d love to contribute. Yes, I have the same sentiments, a flush of monies to help you, Mary, to get started on your big goal, of having studio space. Though in the long run (horse to water saying) maybe, a virtual online classroom with paying students from around the world getting together to learn from you might help sustain you financially. I’m sold as you as a competent instructor and would save tuition for a class taught by you! Happy New Year to you, Mary, and y’all here! May God bless your endeavors, Mary. Holy Mary Mother of God, please, pray for us. I think a Go Fund is a wonderful idea! Happy New Year to you. I would like to follow and join in that project. In fact I have a denim skirt that needs patching on one panel and I was looking at the kaleidoscopes to fill the panel. Happy new year, Mary! I am thrilled to learn that you plan to open a classroom space in 2018 and to give lessons. I don’t live close enough to come to a weekly lesson, but if you offer weekend or weeklong workshops, I will definitely sign up. This is great news–I am rooting for you and your new year’s goals. Happy New Year to you too Mary! I figured you were probably spending some family time and getting ready with plans for the new year. Sorry that you were not feeling in top form but I always say rest heals wonderfully. Do you know the James Herriott story of the sheep that was left off to one side to slowly die? James gave it a massive dose of a sedative (without the farmer’s knowledge) to put it down and it slept for days, woke up right as rain. It sounds like your goals are going to be fun and I look forward to seeing the product of them on your blog here. Take care of yourself, I really enjoy reading about what you’re doing needle wise and perusing all the wonderful sites that you recommend to us. Stitching tourism to a retreat in your part of the country was my first thought when you mentioned obtaining teaching space outside your home! Happy New Year, Mary. You’re the Best!! Thanks for all you give….. Happy New Year to you, Mary, and a big thank you for your inspiration and generosity. Glad you’re feeling better, missed you! Hope your plans for the year go well; looking forward to them all! And a Happy New Year to you too! I hope your plans come to fruition and look forward to hearing about them. Ooooh…Anticipation, indeed! With great appreciation for all you have given us in 2017 and with an eager eye to 2018, I wish you and the whole community a Happy New Year. May health and joy and fruitful relationships and accomplished goals be unfolding all through the year. Happy new year to you, Mary ! I wish you the best of everything and I hope to read your post along all the year and appreciate again your stitching, teaching and telling. A very Happy New Year to you. Great news that you are opening up to teach embroidery to children and others I just wish I lived close enough to join on of your classes. Thanks for all your hard work here on Needle ‘n Thread and for your encouragement and support you continually give us God Bless. Look forward to future embroidery articles. Happy 2018 to you Mary – may you accomplish all your goals and many more! I hope you have a most wonderful year filled with all that you enjoy especially peace, happiness and health. I hope all your plans, wishes and expectations come true. Happy New Year to you, Mary, and to all the stitchers out there! I wonder what’s a “Winter Wog” – a cold? If so, we’re in the same boat, and I hope you’ll get well soon! Mary, Darcy had such a great idea: Start a “Go Fund Me” page! I would happily contribute whatever I can, and I’m sure many others would, too! It would be a grand possibility of appreciating your yearslong work as well as helping in keeping alive this unique gathering place for needleworkers from all over the world. I wonder if you’d mind if I send you some photos of the Christmas stockings I sewed and embellished with some of your Christmas Trees? Happy New Year, Mary! May 2018 for you and all your readers be happy, healthy, peaceful and full of good stitching. As usual I have more planned than I can possibly accomplish, but that’s the point of plans – to always have something to aim for. Happy New Year to you Mary! May you get all that you hope for in 2018! Happy new year Mary, I share your love of a new beginning with the possibility to be thankful and appreciative for the people in my life, to get organized with my list of futur accomplishments, to prioritize the projects I want to embroider and one on the top of my list is the Party in Provence which I have been drooling over since I first set my eyes on it. No pressure but it is at the top of my list now that I know you intend to cover it this year. I hope the best for you plan to get back to teaching children, what a great feeling when their eyes get sparkling (if this is a word!) either because they “get it” or because they are proud of themselves. I wish you all the best and look forward to the growth and development of Needlenthread, such an invaluable resource for us in the community! Happy New Year. Good luck on your 2018 goals. I love your blog posts, this on particularly, it’s reminded me that it is the beginning of a new year. Sounds daft I know, but I rarely make resolutions. I’ve been promising to do a year of stitches, for at least three years I’ve been meaning to do one. I think this year is going to be the year I do it. Thanks for sharing what you do, I’ve learnt so much from you. Happy New Year to you and all your followers, Mary. Thank you for your contribution to the stitching community everywhere- – I wish all a happy, healthy, stitch-filled year ahead! I echo Heather in Seattle: Holy Mary Mother of God pray for us- and her most chaste spouse, Joseph, pray for us. Mary, I look forward to whatever you present. I did my own funding. I went out and bought the Christmas Trees. As a farmer, I know that every bit helps! Mary, hope you are on the mend. A very Happy & Healthy New Year. I will be following along with you as you all stitch Provence. Looking forward to tips. Happy New year Mary. I wish you the very best : Joy, love, blessings and above all good health. Happy new year to you Mary ! Previous Previous post: A Stitcher’s Christmas Winners & a Reader’s Finish!